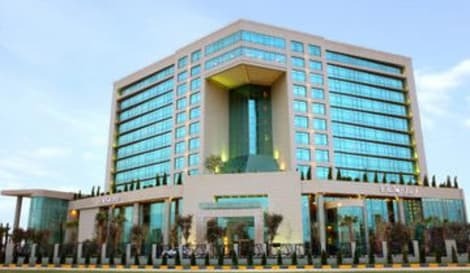 This hotel is located in Erbil. The rooms that make up this hotel are spacious, where you can enjoy the views of the city. All of them have a fully equipped private bathroom and also have different amenities that will make you feel at home: TV, air conditioning, Wi-Fi, telephone, safe, heating, hair dryer and minibar among others. After a day of sightseeing in the city, relax with a swim in the indoor pool or with a session of sauna or hydromassage. The hotel also has a gym where you can perform your daily exercise routine. If you are staying for business, the hotel has space to hold meetings as well as a business center where you can make your arrangements. Enjoy your stay and the experience! This hotel is located in Ankawa, a short distance from the center of Erbil. The rooms that make up this hotel are spacious and bright. All of them have a fully equipped private bathroom and also have different amenities that will make you feel at home: TV, Wi-Fi, telephone, hair dryer, among others. Relax with a dip in the hotel's indoor pool or with a sauna session and keep your exercise routine at the gym. Enjoy your stay and experience! Erbil Rotana is located ten minutes away from Erbil International Airport and in the midst of the Fairground as well as business centers. Adjacent to the English and Italian villages. Overlooking the breathtaking Sami Abdul Rahman park, one of the largest parks in the Middle East. The hotels exceptional location also gives an opportunity to explore touristic sites such as the historical (Citadel) and downtown bazaars, making the property convenient for the business and leisure travelers. Newly opened, Tangram Erbil is the first business lifestyle hotel in Iraq. Conveniently located in the South part of the city, in the Rasti area, Tangram Erbil is the perfect gateway for a business trip to Erbil. Each of the 118 rooms is well equipped, quiet, spacious and offers a view. lastminute.com has a fantastic range of hotels in Arbil, with everything from cheap hotels to luxurious five star accommodation available. We like to live up to our last minute name so remember you can book any one of our excellent Arbil hotels up until midnight and stay the same night.